Bolt- Down solid steel rack protectors cover the base of the upright and are anchored in the concrete. 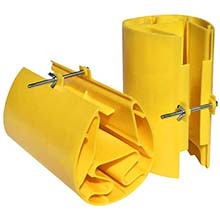 Has a durable yellow powder coat finish and fits 3" uprights. The 4 Rivet snap-on connection makes installation simple and easy at any level of the upright allowing for protection at every bay level. Adjustable in 2" increments. Mounts directly to the rack upright via straps without the need for any tools. 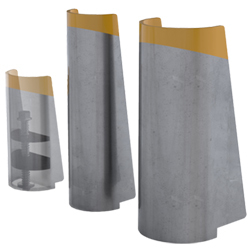 Exceeds European FEM standards for collision protection and can take multiple impacts lowering replacement costs. 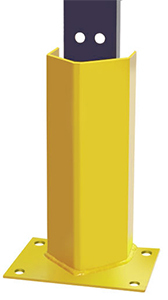 Snap-on Column Guards fit around 3" uprights and can be stacked to provide more protection. Installation is quick and easy at any bay level with no tools required. Includes bolt and hand-tightened wingnut for more secure attachment.